We got snapshot in the mail today for our 10th anniversary. It is a headshot of a very young Claire. Sometime within the last five years, the United States added another stipulation before it would allow Americans to adopt Chinese girls. 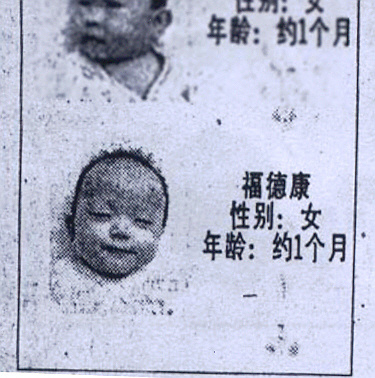 To ensure that Americans were adopting true orphans, they required the Chinese government to post a “foundling ad” in the local newspapers for all abandoned children. Only after an ad goes unanswered will it allow the Chinese government to place that child with an American family. This is in case the child was abandoned by one parent without the spouse’s consent. Last March when we at the orphanage, we asked the director for a copy of Claire’s newspaper clipping. The Director dismissed us saying that they had lost all the early records. The families then asked to be taken the abandonment sites, to which the Director replied that they all were under water. (Fuling is next to the dam-flooded Yangtze river, so it was possible.) At the time, it seemed like her replies were more expedient than accurate. Recently Chris got in touch with a father who was touring China to research this information for fellow adoptive parents. For a small fee, he would visit the Orphanage and the abandonment site, taking pictures and videos, and search for the foundling ad. To us, even the smallest piece of information may help Claire connect to her beginnings. To my knowledge, no child has ever been reunited with her birthparent through these ads.